Online PR News – 29-September-2011 –Boys & Girls Clubs of Greater Oxnard and Port Hueneme joins the national launch of the “Great Futures Start Here” PSA campaign. The PSA features 21 notable Club alumni and showcases the impact the Club experience has in transforming the lives of young people. Watch the PSA here: http://bgca.org/newsevents/Pages/GFSH_PSA.aspx, which debuted during an event at the National Press Club in Washington, D.C. Check out the video on our media page! Battle of the Badges Charity Event! Get your ticket NOW! 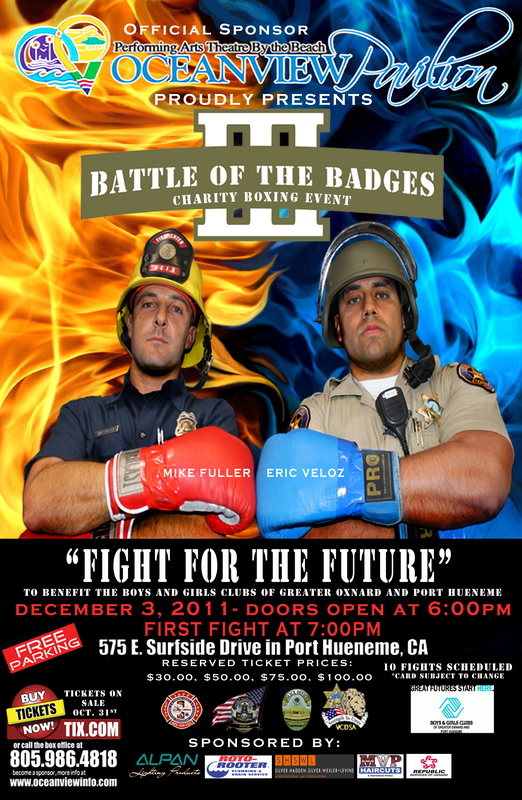 Port Hueneme, CA – On Saturday, December 3rd, Oceanview Pavilion, official sponsor, will host the “Battle of the Badges III” the 3rd Annual Amateur Boxing event benefiting the Boys & Girls Clubs of Greater Oxnard and Port Hueneme. The charity boxing event will feature deputy sheriffs and police officers versus firefighters from Ventura County. This boxing event puts members of the Ventura County Deputy Sheriff’s Association and other law enforcement officers up against the Ventura County Professional Firefighters Association and other firefighters for a good cause. The Ventura County Deputy Sheriff’s Association, the Ventura County Professional Firefighter’s Association, Oxnard Police Officers Association, Port Hueneme Police Officers Association and Oceanview Pavilion have come together to unite in the spirit of giving from the heart to benefit our communities. Money raised will go to support over 7,200 youth at the Boys & Girls Clubs of Oxnard and Port Hueneme. “We are eager to help the kids served by the Boys & Girls Clubs by showcasing the good-natured rivalry between cops and firefighters,” said Sergeant Matt Findlay, VCDSA president. “Oceanview Pavilion’s Performing Arts Theatre by the beach is honored to join hands with the Ventura County Firefighters Association, Ventura County Deputy Sheriff’s Association, Oxnard Police Officers Association, Port Hueneme Police Officers Association and the Boys & Girls Clubs of Oxnard and Port Hueneme,” said Sharon Kloeris, Executive Vice President. The Official sponsor is Oceanview Pavilion and current sponsors include Oceanview Pavilion, Roto-Rooter, Alpan Lighting and the law firm of Silver, Hadden, Silver, Wexler & Levine, MVP Haircuts, Dominos Pizza, the law offices of David Lehr, Ventura County Credit Union and Republic Services of Oxnard. The doors open at 6:00 pm with the first bout starting at 7:00 p.m. There will be 10 matches, each are three, two-minute rounds. Tickets are available for $30 general admission, $50 reserved, $75 reserved, $100 reserved and $100 VIP. or Sharon Kloeris (805) 986-4818 or Sharon@oceanviewinfo.com for more information. The Boys & Girls Clubs of Greater Oxnard and Port Hueneme (BGCOP) is a nonprofit 501(c) (3) youth service organization serving over 7,200 boys and girls ages 6-18years. The Mission of BGCOP is “to inspire and enable all youth, especially those who needs us most, to realize their full potential, as productive, responsible and caring citizens”. Annual member dues is $15.00 however, no one is turned away regardless of ability to pay. Program Areas include: Career & Education, Character & Leadership, Health & Life Skills, The Arts, and Sports, Fitness and Education. Services are provided in 3 freestanding clubhouses, 13 public schools, 1 public housing site and 1 Juvenile Justice Center. The BCGOP serve an additional 5,000 youth through community activities, sports and special initiatives. For more information, visit, www.positiveplace4kids.org. OXNARD, Calif, September 29,2011—With nonprofit donations down due to the economy, the Boys & Girls Clubs of Greater Oxnard andPort Hueneme decided to take a different approach to fundraising. The 2011 Boys & Girls Club Million Dollar Raffle gives ticket buyers a chance to win a grand prize of $1 million and ticket proceeds help the Club provide vital enrichment, social and academic services to its more than 7,500 needy youth in the community. Million Dollar Raffle: 1st Earlybird drawing winners! To encourage quality family time and celebrate children, the Boys & Girls Clubs of Greater Oxnard and Port Hueneme will present its sixth annual Day for Kids on Saturday at the Martin V. Smith Youth Center in Oxnard. READ MORE HERE! CLICK ON THE LINK BELOW! Children thrive when they have a caring adult in their lives. To encourage quality family time and to celebrate children for who they are, the Boys & Girls Clubs of Greater Oxnard and Port Hueneme invites the community to the Sixth Annual “Day for Kids,” 11 a.m. – 4 p.m., Sept. 24 at the Martin V. Smith Youth Center, 1900 West 5th Street, Oxnard. The fun-filled afternoon is free and includes entertainment and activities for children of all ages.